"It's lots of fun to have you there." 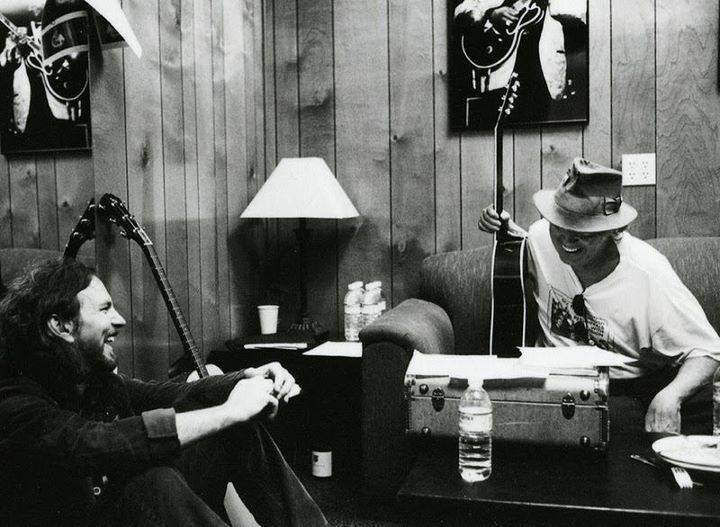 Hanging out backstage with Eddie Vedder & Neil Young at the Bridge School Benefit Concert 2011. The official Pearl Jam | Facebook page posted the photo above for Neil's birthday this past weekend along with the caption: "It's lots of fun to have you there." Ed & Uncle Neil. Lots of fun. More on Neil Young Celebrating Birthday @ Sustainability Forum in Brazil. I am so glad these two are good friends. You just know they enjoy themselves when they are together! I was a student at Kelvin High in 63 . Neil Young was a student at Kelvin High School in Winnipeg at that time. Neil of course was not known or famous at that time. We did not even have a real gym only an auditorium. Neil did not like the gym class. And Catchmore did not like Neil. Catchmore used to yell at Neil all the time. Mike was a hotdog in charge of the prestigious ( at least in his mind) football team. It was common knowledge and apparent at that time to all that Mike Catchmore had yelled at Neil "You will never amount to anything". It should be pointed out that this idiot Mike Catchmore yelled at everyone with his insults. It really amounted to nothing at the time. However Neil is famous now. If Neil was not famous it would of amounted to nothing. Mike Catchmore was a stupid idiot and still is one. A while ago I got the remastered reissue of Coney Island Baby. It has some bonus tracks. There's an unreleased version of the title track included. Even better than the original. Neil never wrote a song about his gym teacher and Lou Reed wasn't a student at Kelvin High School in Winnipeg. you believe in or not I wanted to play football for the coach"
How do I buy this poster. I really want it. My 2 favourite musicians.